Sorry to have been out of action for such a long while. Didn’t mean to, just happened. Anyway no excuses, but glad to be back. I do have a lot of recipes written down based on what I prepared for the last several months. But I wanted to get back in the kitchen and into cooking. Having been in the mood for eating spicy food lately, hence whatever I cooked in the last couple of days have been that. 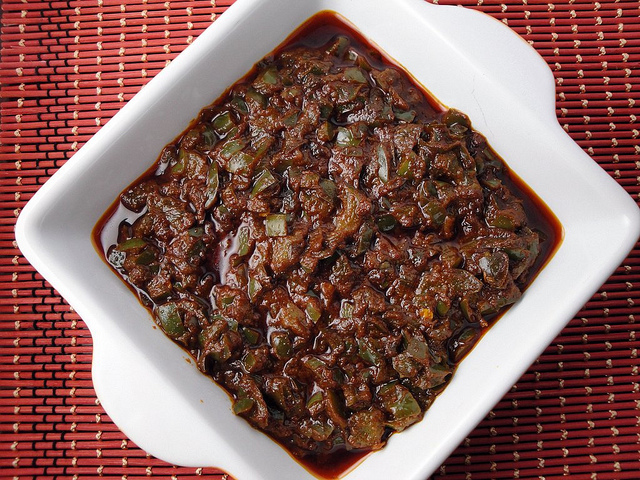 I would like to start off with what I made yesterday, an Indian style pickle made with green pepper. Green pepper was chosen just because by mistake we ended up picking 7 of them during our regular grocery round, which for 2 people is quite a lot. I borrowed on the basic pickle recipe that goes really well with mangoes and other vegetables, but just gave a a little variation by using black salt instead of regular white salt. Black salt has its own bursting flavor and unique taste that goes along well with chaat masala, and as part of seasonings. I bought some recently, and its going to feature in quite a lot of the dishes that I will be preparing over the next few months. Dice the green pepper into small pieces, after removing the seeds and stem. On a non stick pan on medium heat, add the oil. As the oil heats up, add the red chili powder, asafoetida, cumin and coriander powder. Stir everything a bit in the oil as the ingredients get cooked and impart their flavor into the oil. The moment you get a nice aroma of the spices in the hot oil, immediately add the green pepper to it and stir well. We have to make sure that the powders do not burn in the oil. Hence the timing is important. Add the turmeric powder and black salt, and mix everything well. Keep cooking on medium flame until most of the water from the green pepper evaporates, it loses its bitterness, and most importantly you see all the oil start separating from the green peppers. Taste the final product to make sure the peppers are cooked well, and shut the flame off. Store it, and serve as a accompaniment to rice and dal, or stuff it between buttered bread and have a go at it. Enjoy!